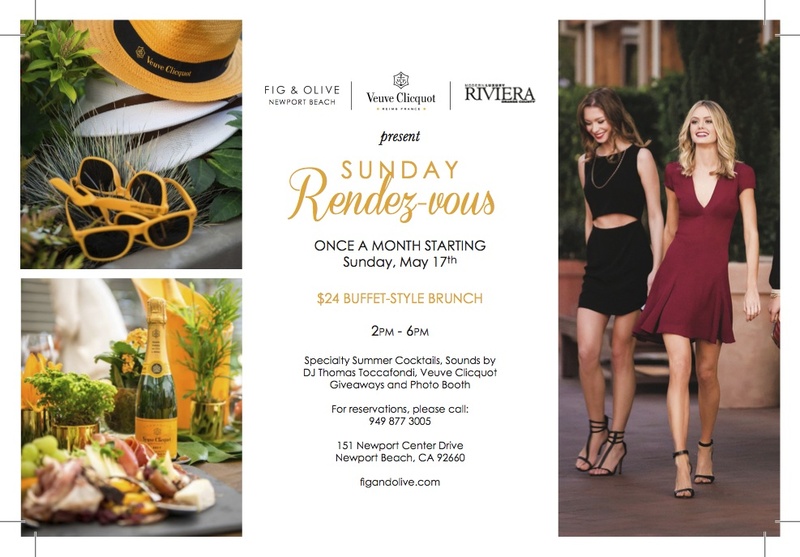 Taking place this weekend on Sunday, May 17, 2015 from 2:00pm – 6:00pm at FIG & OLIVE Newport Beach, the olive oil oasis will launch the monthly event series, “Sunday Rendez-vous” in collaboration with Veuve Clicquot for an afternoon of bubbly and bites. Stylish OC denizens will be greeted by the sounds of St. Tropez from FIG & OLIVE’s resident sound designer, Thomas Toccafondi on the terrace. Veuve Clicquot will capture the afternoon of festivities with a themed photo booth and offer party favors to lounging guests as they enjoy a midday getaway of champagne and cocktails. Reservations for the Sunday Rendez-Vous and Riviera Brunch Buffet on the terrace must be made in advance by calling (949) 877-3005.